Just 3% of pilots are women – so what can be done to solve the imbalance? Home > Article > Just 3% of pilots are women – so what can be done to solve the imbalance? Jonathan Candelon, MD at FTA, asks, how can we encourage more girls and women to consider becoming commercial pilots? According to a recent article, about 3% of pilots globally are women; that’s about 4,000 out of 130,000 pilots worldwide. It’s nearly 50 years since the first woman became a commercial pilot but numbers are still relatively low. British Airways employs around 3,500 pilots, but only 200 of those are female – and that’s more than any other UK airline. Only 5.4% of US airline pilots are women, the same percentage as it was decades ago. However, most female pilots in the US speak at schools, to encourage girls to follow in their footsteps. In addition, national programmes like Girls in Aviation Day are designed to promote interest in scientifically minded young women. With the forecast shortage of pilots, much talked about in the US, airlines are hiring. Delta, for example, has hired 1,600 pilots in the last 18 months and about 4% of their pilots are women. One possible reason for the low number of women pilots is that juggling family life and childcare with a pilot role, could be perceived as a challenge. But Lisa, a Boeing 757 and 767 Captain for Delta, says that it’s possible to juggle family life with a career in aviation. Lisa has three teenage daughters but has flown for the last 30 years. Her 18 year-old daughter has just completed her own first solo flight. However, according to a recent article in the Daily Mail, the current crop of female pilots have little time for those who think that the hours and time away from home put women off a career as a commercial pilot. “It’s the same working lifestyle as cabin crew and we have 15,000 cabin crew, the majority of whom are female,” says Cliodhna Duggan, a current female BA pilot featured in the article. “And pilots, particularly as their careers progress, have a degree of flexibility over the days or routes they work,” she adds. Whilst many young female pilots would embrace more ‘family friendly’ schedules, all speak highly of the exciting and unique job role. “Sometimes, you’re skimming above the clouds and you think, ‘I’m being paid for this,’” says one US female pilot. Things are changing here in the UK however, with strong female role models including high profile aviator, Carol Vorderman, who is preparing for her round the world solo flight and whose daughter, Katie shares a love of flying. Carol was recently quoted in the Daily Mail, encouraging women to consider roles traditionally undertaken by men. Wendy, who flies for a leading international airline as a captain on the 777-200 and 300 fleet says, “I grew up loving flying from an early age and by 12, I’d decided to be an airline pilot – in an age and a profession where women pilots were virtually unheard of. I was an only child and my father, who had desperately wanted a son, encouraged me enormously,” she said. “Both of my parents were an inspiration really as both had been incredibly successful in their chosen careers. They both made me believe that anything was achievable with hard work, dedication and strong determination. Fortunately they were proved right – they had convinced me to carry on when everyone around us was telling me to stop dreaming about such a ridiculous and impossible ambition. “My father learnt to fly when I was 14, and I was in the back seat for most of his lessons. He and his friends regularly let me take the controls of their aircraft – they seemed fascinated by this rather determined female, aviation-mad teenager,” laughs Wendy. On the subject of juggling family commitments, Wendy says, “I’ve had two children during my career, (now 19 and 22), and with the nature of long haul flying and the time off required between trips, I spent far more time with them than many of my friends did in other demanding professions. There’s plenty of opportunity now for part-time working too. However, I remained full time and in order to achieve a successful household, you definitely need to be very organised, with very efficient help at hand, (we had live-in nannies until age 10 and then au-pairs), and have very little time for anything else other than family life. But I’ve loved every minute of combining the two and would do the whole thing exactly the same again if I was given my time all over again!” concludes Wendy. Another inspirational figure in UK aviation is Dorothy Saul-Pooley; until recently she was master of the Honourable Company of Air Pilots. Dorothy was interviewed by British Airways when they were looking to encourage more women into their scheme – this interview led to Clare Walker, past Chair Women in Aviation & Aerospace, RAeS (Royal Aeronautical Society) writing a piece called ‘Why Don’t More Women Fly?’ , which Dorothy was involved with. The general consensus of the article was that the lack of female pilots was due to a lack of role models (and any female role models weren’t promoted enough) plus there’s an issue with gender stereotyping in schools, when it comes to pushing education and career choices. However Dorothy feels that even though there are now more opportunities for people to go into any profession that they want and there is less of a gender divide, there are still issues. “Parental influence and encouragement is key.” she adds. “For example, if a father likes football he will usually pass this interest on to his son. And for young girls, their mothers normally encourage stereotypical ‘female’ behaviour, for example an interest in dance or role-playing with dolls. This sparks a good debate about nature versus nurture! “There are still economic disadvantages for women in the workplace, especially those who work in male dominated industries. Most are still paid 20% less than men, despite recent campaigns by the likes of Grazia magazine,” adds Dorothy. “With this kind of thing, not just women wanting to get into aviation but women wanting to get into stereotypically male job roles, it’s been instilled into society for as long as we can remember and it’s a difficult job getting out of this,” she concludes. Why does BA pilot Aoife Duggan they think so few women go into flying? As she told the Daily Mail, |A lot of the time it’s a matter of younger girls not being made aware that it’s a career option open to them. The movement towards more women pilots is spreading to other countries, where roles have traditionally been strongly defined for men and women. In June, Iraq’s Ministry for Transport announced that a young, British educated Iraqi woman has become the country’s first female commercial pilot. Dalia, will be the first Iraqi female to hold the title of Flight Captain for Iraqi Airways, according to TV channel, Al-Arabiya. With all of this in mind, FTA has decided to run a programme of short talks in both local primary and secondary schools to raise awareness of the pilot career as an option for both sexes. 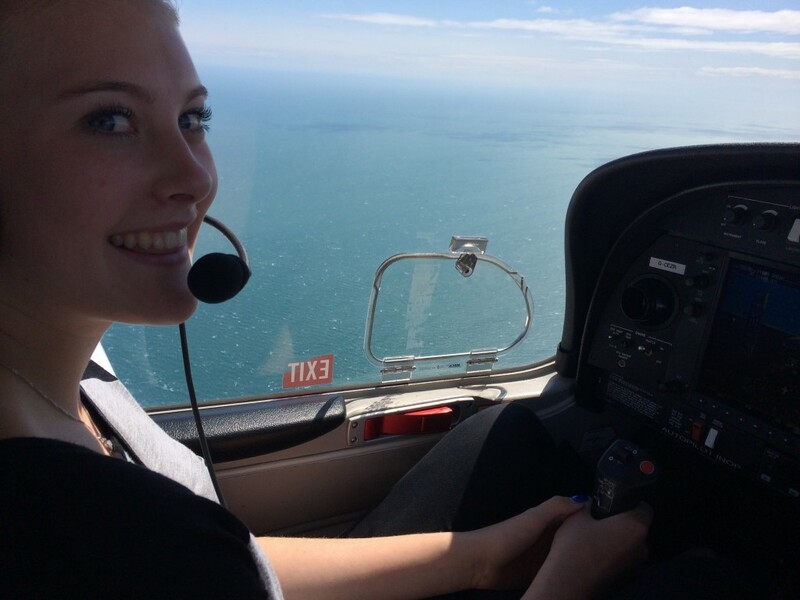 FTA has also held a series of prize draw competitions to win trial flights at FTA, with both Ellie Stewart and Molly Sanderson (pictured below) taking to the skies after winning their respective prize draws. And as for me? As a former flight instructor and MD of FTA, I recently told the BBC in a radio interview that after seeing hundreds of cadets become pilots over the years, I have concluded that when it comes to being a good pilot, gender is irrelevant.